[Bagpipe marching band at the Longs Peak Scottish-Irish Highland Festival. Photo: facebook.com/Scotfest] Known locally as Scotfest, this four day festival celebrates the exciting heritage of Scotland and Ireland. It’s one of the premium events in Estes Park, attracting a vibrant crowd to one of Colorado’s more unique festivals. 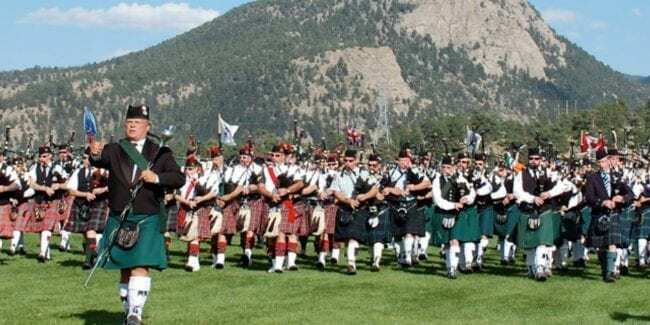 The Longs Peak Scottish-Irish Highland Festival brings to the best Celtic music, Irish and Highland dance, jousting, exhibition dogs, and regional flair to the “Celtic Capital of North America”, Estes Park. There’s even a Ninja Warrior Course at the festival field open to attendees. This year’s event takes place from Thursday to Sunday, September 5th to 8th, 2019 at the Estes Park Fairgrounds and Event Center.